The Capitals star and owner posed for pictures and traded high fives with kids rocking the red, many of whom were on Cloud Nine after touching the Cup. 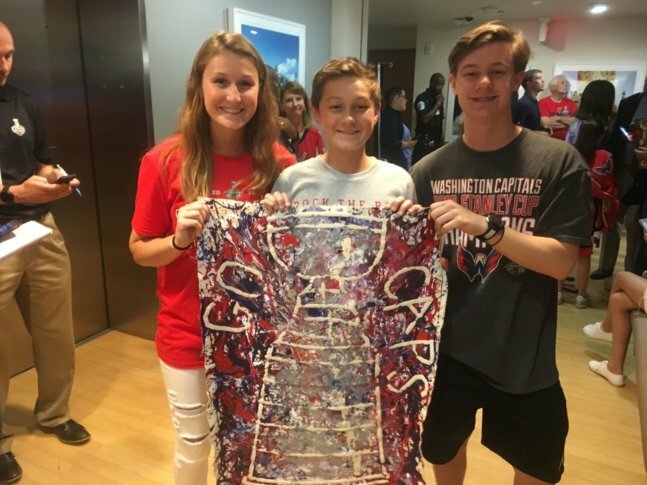 WASHINGTON — In front of a crowd chanting “Caps, Caps, Caps,” a clean-shaven Alex Ovechkin and Capitals team owner Ted Leonsis entered Georgetown University Hospital’s pediatric cancer unit with the Stanley Cup. “We are bringing smiles to these kids,” Ovechkin said. It was an opportunity for the championship team to share its proud moment with dozens of kids who know what it is to fight — many of them champions in their own right. “I finally got to touch the Stanley Cup,” Tyler DeMille, 11, of Fairfax, Virginia, said with glee. DeMille was an infant when he won a fight against leukemia. DeMille was all smiles today when he got to meet Ovi and Leonsis. His mother, Erica DeMille, said some might not realize how important visits like these are, especially for kids currently undergoing treatment. “When life is almost taken from you, every moment of every day, whether it is something small or something big, means more than it does maybe to people who haven’t been through this,” Erica DeMille said. Leonsis said as a father, and as a Georgetown student in the 1970s, it was important that he come to the campus and hospital with the Cup. “I wanted to make sure that every single kid got to touch the Cup and get a picture taken with Alex, and I think we met that goal,” Leonsis said. For Ovechkin, it was a familiar crowd, since he and other team members have spent time in the hospital. In the Tracy’s Kids Art Therapy room at the Lombardi Comprehensive Cancer Center, where the Cup was on display, pictures on the wall show players, including Ovi and T.J. Oshie, drawing and painting with children during prior visits. “They give these kids a very special day and a very special escape during a very complicated time in their lives,” said Matthew Gerson, founder of the pediatric art therapy program. Some longtime cancer survivors were also in attendance, including Ryan Tomoff, 23, of Crofton, Maryland, who has been cancer-free for 20 years. “I was always cheering for them, even though I was sick as a dog,” Tomoff said. The stop at Georgetown Hospital was among three stops Friday for Ovechkin and Leonsis. Other destinations included the Arlington Police Department and the Fort Dupont Ice Arena in Southeast D.C.